Seasons of Giving: Dialog Wheel’s Gaming Giftaway! With Thanksgiving last Thursday, #givingtuesday this week, and Christmas inching closer, the season of giving each other stuff wrapped in shiny paper is definitely upon us. Sometimes it may feel more like the season of spending in the video game world *cough* Steam sale *cough* especially with the console wars in full fanboy force. We at Dialog Wheel aren’t really into the whole commercialist funding of civil wars, so we’ve decided to join forces with the PC crowd this year for everyone’s favorite commercialist tradition: Gifts! Although we were planning to ask you for gifts, we decided we’d play nice and give you readers something for your support (in secret hopes that you buy our editorial staff PS4s). There’s lots of giving going on in the gaming community, from the grand opening of the Humble Store, where 10% of proceeds go to charity, to some crazy dedicated gamers in Portland who played games to collect food for a food drive, so in the spirit of the season, we’re doing a little giving of our own. That’s right, Dialog Wheel is giving away games! Like, you know, for Free! A reminder to the editors: No you’re not eligible to win this awesome gaming goodness. 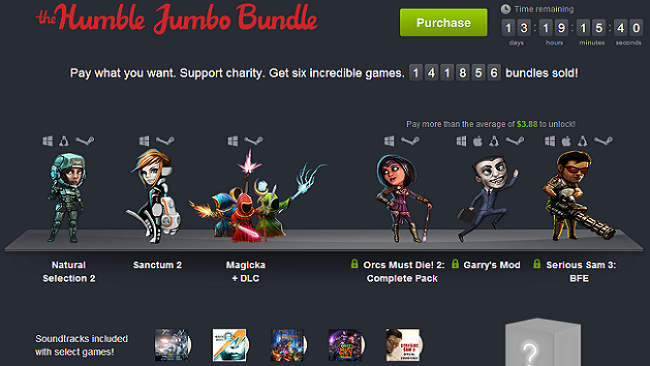 Two winners will receive games from the Humble Jumbo Bundle or the Humble Bundle 9. You’ll get access to more than 6 games that are available DRM free or redeemable Steam codes. Give them to a gaming friend, introduce someone to the wonders of PC gaming, play them in front of your jealous siblings, or keep them for yourself. Because you deserve it. We know how hard it is to get free stuff. Free games for a great cause. Now you can feel less guilty for not sharing the bundle with your friends. The gaming giftaway will run through December 20th and winners will be announced/contacted December 22nd. Only one submission per person. We like our Holiday season themed deathmatches balanced after all. We swear there will actually be cake.